Ordinary Miracles plays at New York’s Quad Cinema from June 22-28, 2012. Filmmakers Q & A after June 22nd, 7pm showing. Playing everyday at 1:00pm and 7:00pm from June 22 – June 28. The filmmakers will be there for a Q & A after the film on Friday 6/22 at 7pm. 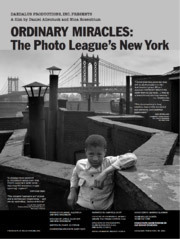 ORDINARY MIRACLES: THE PHOTO LEAGUE’S NEW YORK will begin June 22 with a 1:00pm screening, and will play everyday at 1:00pm and 7:00pm from June 22 – June 28.